It was Jonathan Ross’ 50th Birthday a couple of weeks ago. His present from screenwriter wife Jane Goldman? An adorable puppy who has been named Professor Snowball. After seeing so many sweet pictures on Twitter by Jonathan Ross, LoveMyDog creative director Lilly, couldn’t help herself. 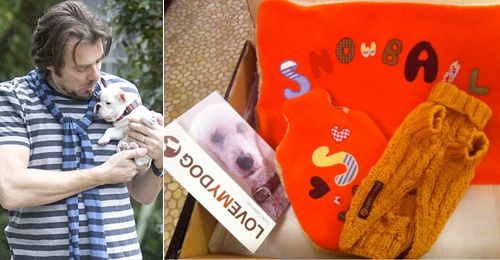 She designed this personalised gift set for French Bulldog Snowball, as photograped and tweeted by the celebrity chat king himself.